HOUSTON, Texas — Four Houston Police Department officers were shot while executing a narcotics search warrant on Monday afternoon. A fifth officer sustained a knee injury during the exchange of gunfire with the suspects. Two officers are in critical but stable condition. Two officers are stable and the fifth officer is expected to be discharged soon. The two suspects were killed. Initial reports indicated five officers were shot. That has been updated to four shot and one injured. Twelve HPD narcotics officers and six patrol support officers arrived on the scene to serve a search warrant. A tip from local residents led to the investigation that revealed the suspects were selling black tar heroin from the home, Acevado stated. As officers breached the door, two suspects inside the home opened fire on the police, the chief stated. Officers identified themselves during the breach and police cars sounded sirens to announce their presence. Acevedo said one of the suspects initially retreated during the exchange of gunfire and then returned to re-engage the officers with additional rounds. The officers returned fire and later learned they had shot and killed both suspects. Two officers were transported by Life Flight helicopters and are in surgery for neck wounds from gunfire. The three remaining officers were transported by Houston Fire Department ambulances. All five are being treated by Memorial Herman Hospital. One of the wounded officers, a 54-year-old senior patrol officer who began his service in 1984, has been shot on multiple occasions before this incident. After robots confirmed the scene was secured, officers entered and confirmed the two suspects had died in the exchange of gunfire with police. UPDATE 7:40 p.m.: HOUSTON POLICE PRESS CONFERENCE: No officers killed, says police spokesman. UPDATE 7:25 p.m.: A KTRK reporter on the scene reports that police say the area is now “secure.” The reporter was not clear on what that means in this particular case. UPDATE 7:20 p.m.: KTRK reports that a Houston Police Department mobile command center has been brought on scene indicating a protracted standoff. Police officials told the ABC news affiliate that two or more people may be locked inside the house where the shooting took place. UPDATE 7:10 p.m.: KTRK ABC13 reports that two officers are in critical condition. 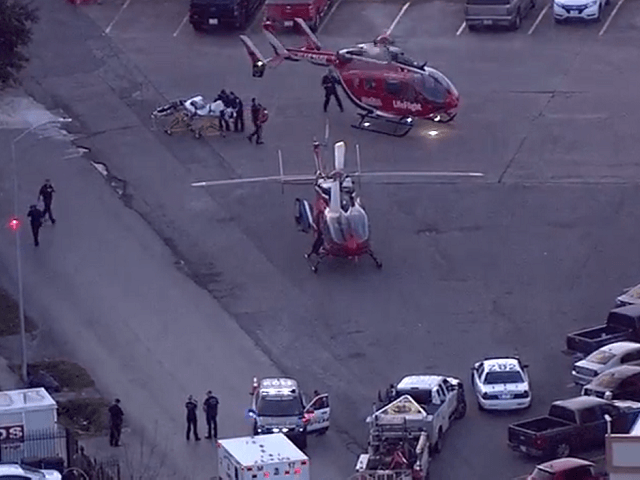 The three remaining wounded officers are reportedly in stable condition. An update from the Houston Police Department is expected at about 7:30 local time. KTRK provided audio recordings of police radio traffic following the shooting of the five Houston police officer. UPDATE 6:35 p.m.: KHOU CBS 11 reports that one officer was shot in the leg, one in the shoulder, and one in the face. Two officers are reportedly in critical condition. UPDATE 6:30 p.m.: KTRK reports that they can hear police negotiating via a bull horn with someone located inside the home where the shooting took place. The five officers were shot while attempting to serve a narcotics warrant, the local media outlet reported. UPDATE 6:15 p.m.: Local media reports state that the search for a possible surviving suspect has expanded to a 20-block area. Houston Police Chief Acevedo has now left the scene and is headed to the hospital to check on his officers. UPDATE 6:00 p.m.: Houston police officials tweeted that five officers have been shot and transported to local hospitals. Houston police officials reported that five Houston Police Department officers were shot Monday afternoon and transported to two area hospitals. One of the officers was taken by LifeFlight helicopter crews. Local reports indicate that two suspects are dead and that a third may be at large in the local area near the shooting. It is also reported that undercover officers may have been on the scene at the time of the shooting. SWAT officers are in the area standing by in case they are needed. “We have had several officers shot please pray for officers on the way to the scene now more information to follow,” Chief Acevedo tweeted Monday afternoon. The Houston Police Department also tweeted the news saying that several officers were struck by gunfire and were en route to a hospital. Houston Police Officers Union President Joe Gamaldi told KTRK ABC13 that five officers were hit in the incident. KPRC reported that the officers were serving a search warrant at 7800 Harding in southeast Houston. Lifeflight is on the scene and officers are being transported to a hospital. The news outlet reported that two suspects are dead at the scene. The condition of the wounded officers has not yet been released. KTRK reports that the Texas Department of Public Safety has dispatched an armed helicopter crew to assist in a search for a possible third suspect. The scene is reminiscent of a shooting in December where three Texas police officers were shot while serving a warrant in northeast Harris County, Breitbart News reported. The shooting left two Harris County Sheriff’s Office deputies and an officer from the Office of the Texas Attorney General wounded. The gunman in this case, took his own life after a standoff. Editor’s Note: This is a developing story. Additional information will be posted as it becomes available.